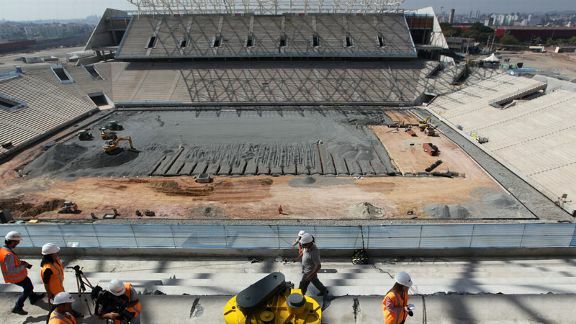 FIFA has admitted that Sao Paulo stadium where the opening match of the 2014 World Cup is due to be played in Brazil will not be ready until April. “We have received information that it will be ready on 14 or 15 April,” said FIFA president Sepp Blatter. However, Sepp Blatter reaffirmed that “there’s no plan B” and the opening match will go ahead as planned in Sao Paulo on June 12, 2014. Five other stadia are still under construction. Two people died last week at the opening match venue – Sao Paulo’s Arena Corinthians, or Itaquerao – as a construction crane collapsed. He was speaking at Costa do Sauipe, a seaside resort in Bahia state where on Friday FIFA will carry out the draw that will define the groups for the opening stage of the World Cup. On Thursday, Brazil’s Sports Minister Aldo Rebelo said six venues – in Sao Paulo, Curitiba, Porto Alegre, Cuiaba, Manaus and Natal – would miss FIFA’s original December 31 deadline and only be ready in January. Brazil’s other six stadiums, including a revamped Maracana stadium in Rio, were opened ahead of last June’s Confederations Cup. The Brazilian government’s preparations for the World Cup have been repeatedly criticized, as they have run over budget and behind schedule.